Preston Blackwell is the Controls Operations Manager at Enervise. As a leader in Smart Building Design, Enervise provides Systems integration for HVAC, lighting, security and access control. Enervise, the leading systems integration company in the Greater Cincinnati Northern Kentucky, Dayton and Columbus area, will keep your entire facility running smoothly. They give you peace of mind that your building automation systems are operating energy-efficiently and cost-effectively. Scott Cochrane of Cochrane Supply & Engineering has the unique benefit of working with 300+ of the best systems integrators in the country. Cochrane recognizes the critical role they have within the building automation industry and is speaking with a different highly-regarded MSI each month with the goal of providing examples of industry trends, best business practices, and the growing value of an MSI. This month, he interviews Preston Blackwell, Controls Operations Manager at Enervise. September Interview Tom Davis of ERMCO, Inc. This month (October/18) he interviews Preston Blackwell of Enervise. Blackwell: There are many paths to becoming an MSI as we have seen in your previous interviews. Enervise’s desire to earn customer loyalty through its total commitment to smooth and efficient operation of the client’s building has led us to this point. That desire continues to drive us forward satisfying not only the needs and demands of our community. The mechanical service company that Thomas A. Winstel founded on the premise that the HVAC business is a relationship business has been continued by his son, Thomas J. Winstel. Enervise, under the guidance of Thomas J., is pivoting towards being a technology company, providing smart building solutions to the market place. This includes not just the traditional integration of HVAC, lighting and power management, but also access control, life safety, bio mechanics and analytics. Blackwell: It takes a village to be a good MSI. With so many disciplines being addressed, a well-rounded team is a must. The people around me are experts at what they do. We all learn from each other and are humble when it comes to what we don’t know. The one thing I can guarantee is that our people know where to find the answers and provide the correct solutions. Blackwell: We listen to our clients, determine their needs and then exceed their expectations. We do sell plan and spec., however Systems Integration is a relationship building evolution. It is an opportunity to educate our community on efficiency, technology, sustainability and stewardship. 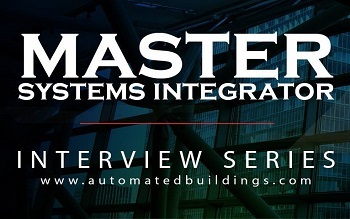 Master Systems Integration can be a big bite to chew on, so we provide options and a path to achieve MSI even if it is a little bit at a time. Blackwell: Our Clients are procuring MSI services from all angles and avenues. Due to this we must be agile. Customizing our contracts to facilitate design build, owner direct, as a sub-contractor or even as a general contractor. Flexibility and interoperability are truly characteristics of being an MSI. Blackwell: Wow, what a great opportunity to put ourselves in others positions and try to make their job a little easier. What does it take to protect a company’s data and how can what we do help. How do you convince others that everything is okay outside of the box when they’ve been in the box for 75 to 100 years. That’s correct if you don’t like the job we did you will be able to call someone else. In fact, we’ll help you find a reputable partner. These aren’t challenges these are opportunities to grow and do the very best that we can. Blackwell: Absolutely. Enervise, as stated above, is becoming a technology company that also happens to provide the mechanical portion of Master Systems Integration. Now instead of integration being brought to the table by our mechanical relationships, our MSI relationships are providing opportunities for the mechanical department. That is our vision, to continue what Thomas A. Winstel began by being an innovative leader in the community and becoming Trusted Advisors.